"Her five-night breaks encourage a total digital detox with a clearly thought-out daily schedule to ‘hold’ you so you can truly relax and reconnect with yourself. Gourmet vegan meals (all sugar and wheat free) are exceptional – you’ll be surprised just how tasty plants can be!" "For Free Spirits: Yobaba Lounge is a quirky, stylish boho village chateau in Southern France. Gertrud, the owner, has a passion for authentic yoga and outrageously good raw food. Either go on a dedicated retreat, or do your own thing..."
"Yobaba Lounge in the mediterranean French Pyrenees is running an inspirational new 5-day signature retreat called ‘Breathe from the Soul’ this year, combining stillness, breath, guided visualisation and meditative movement to help you turn inward, develop a self-practice that you love and help you reconnect with the wisdom of your body. ....."
A lovely vote of confidence from one of our guests: Natural Health Magazine publishes feedback on their feature on us last year. "Relax, reflect and refresh. Last year, I stumbled across your feature on the Yobaba Lounge in France (p110, January 2015 issue). I cut the article out and kept returning to it with intrigue. A few months later my mother passed away and after several emotional months, I decided I needed some time away to rest. 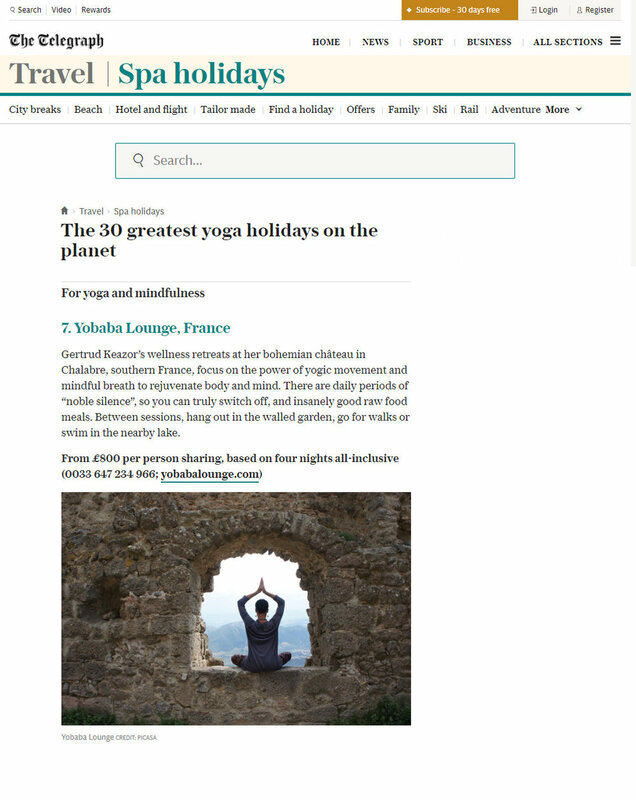 I booked a five-day yoga retreat at the Yobaba Lounge and it was exactly as described in your article. I returned home feeling rested and nourished. Thank you for featuring such a hidden gem. I've since passed the cutting on to a friend who plans to visit next year. I hope she then passes it on to a friend of hers." This stylish, bohemian village château nestled in the heart of the French Pyrenees is owned by the impressively creative Gertrud Keazor, who runs regular five-day wellness breaks. There are two-hour sessions of yin-style yoga and meditation four times a day, and each retreat includes periods of silence. This year teachers include the Sanskrit scholar Dr Christopher Wallis, the ashtanga and yin yogi Luiz Veiga and the Zen Buddhist meditation teacher Myosen Cimiotti. The (mainly raw) meals are exceptionally tasty. "My energy is flowing, my body is stress free, I feel powerful"
El Pais, Spain's leading newspaper, included us on the weekend in their S Moda supplement and review of yoga retreats with a difference. Our formula is unique. And effective. If you need some space, want to get away, and hear yourself think again, come and stay. We have beautiful, satisfying vegan food, stylish, bohemian accommodation and pure, pristine and inspirational yoga that is suitable to beginners as well as experienced yogis. "A chic retreat in the foothills of the French Pyrenees mountains held in the medieval village of Chalabre ..." Asia Spa includes us in their round up of wellness retreats.